Memorial services will be held for family at later date, Evelyn Dorothy Jane (Lynde) McClure, 94. Cremation has taken place. She died Thursday November 1, 2018 at home, surrounded by her loving family. Born April 22, 1924 in Omaha, Nebraska, she lived in an orphanage until the age of two. I.W. and Winnie Lynde of Gillette, Wyoming adopted her. She was raised on the ranch located 18 miles south of Gillette. 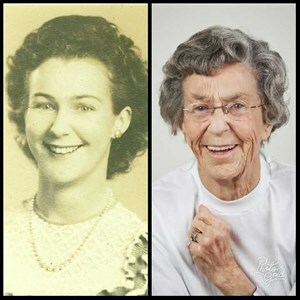 She went to school in a little one-room schoolhouse two miles south of the ranch until high school when she moved into town; she graduated in 1942. When she was 15, she met her future husband Herschel W. McClure at one of the dances held at the D-Bar-M clubhouse; four years later, she married him on August 9, 1943. Out of the marriage came four children, Terry, Phyllis, Susan, and Jeff. They worked for Keeline Cattle Company after they were married. He as a cowpuncher and she was the cook at the cow camp. Herschel went into the Army in April 1945. Evelyn moved to Sheridan and lived with her in-laws while attending beauty school while her husband was in the service. She opened her own beauty shop in Sheridan until her husband returned from the Army. He went to work for Wnderlick Construction Company and they moved to Kingman, AZ to where the company had a contract to decommission 10,000 military aircraft; Evelyn worked in the mess hall. After Kingman, they moved to Colorado with the construction company. In 1954, they moved their family to Sheridan, WY. Evelyn worked part-time wrapping wild game meat during hunting season. Her greatest moment wrapping meat was when the movie star Robert Taylor brought in his kill to be processed and she talked to him. Later she went to work for National Coil Factory. In August 1966, they moved to Casper, Wyoming. She went to work for Weinrich Quality Meat wrapping meat year-around for them. She later went to work at Control Data building computer boards and became a supervisor over thirty girls. She is survived by her four children; Terry (Ann) McClure, Phyllis (Terry) Letz, Susan (Neal) Miller all of Casper, and Jeff (Kim) McClure of Young, AZ. Nine grandchildren, Adam, Aaron, Alexander, and Andrew McClure, Jason and Todd Letz, Quinton Miller, and Eric and Staci McClure. Four great-grandchildren, Kristopher Letz and Laura Prochnow, Tyler Letz, and Bristol Ana Miller. One great-great grandchild Logan Muije. She was proceeded in death by her parents Issac Worth and Winnie E. Lynde, sisters Dorothy J. Lynde, Bonnie Jean (Lynde) Marquiss, brothers, George I. Lynde, Joseph E. Lynde Sr., John L. Lynde, and husband Herschel W. McClure. Memorial contributions may be made to the Casper Humane Society. To share a special message with the family, please click the "Share Memories" button above. Add your memories to the guest book of Evelyn McClure. Phyllis, I am so sorry for your loss. My thoughts and prayers are with you and your family. I had the pleasure of meeting Grandma while visiting the Millers several years ago. She left a lasting impression upon me of the type person we should all strive to be. From the moment I was introduced to her I felt that I had known her all of my life. I could feel the warmness and sincerity of her attention, words and smile. She made sure that I, a stranger, who had travelled more than 11,500 miles felt welcomed and at home. Thank you and God bless you Grandma. I shall never forget you and always carry you in my heart. My time with Evelyn was short, but she touched me deeply. At 94 she still had such a twinkle in her eye when she spoke of her husband and children. She was so strong and independent until her last day. When I thought I couldn't do something, I thought of 94 year old Evelyn, and I succeeded. I wish I could have met you sooner, so I could have loved you longer.